This isn't the first time I've visited London, nor even our second, and not - I suspect - the last. 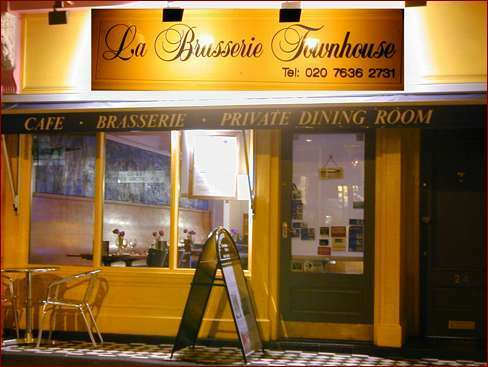 Once again we stayed at the Townhouse Brasserie, on Coptic Street, just down the street from the British Museum. This isn't lodgings for the faint-of-heart: the third- and fourth-floor walk-up staircase is narrow, the rooms have drafty windows (which were fixed by artful draping of my jacked and wool sweater), a rather dingy bathroom is shared by the four rooms, and there have been no major (or perhaps even minor) improvements since my first stay here in 1999. On the up-side, the restaurant downstairs is pretty good, there are other good restaurants around the corner (read on), and the B&B is so centrally located it overcomes the drawbacks (for us, at least). You're right in the middle of everything; you can walk to the theaters in seconds, to Covent Gardens (and several shopping districts in several directions) in two minutes, to the Thames in a few more than that. If you're fussy you may want one of the London hotels in Bayswater, north of Hyde Park, and you'll have a more expensive traditional room with en-suite bathroom. You'll also have a walk to the Underground (which closes around midnight) each and every time you want to do anything in London. London has an amazing breadth of dining choices, both in cuisine and price. You'll find an amazing variety of Indian, Hungarian, Italian, French, traditional English, Japanese, and so on. Some are walk-in with food to take away (including one pre-wrapped sushi place near the Embankment Underground stop. Others are semi-formal sit-down restaurants with linen tablecloths. Described here are but a small number of all the eateries near to our B&B. One could be here a month and not sample them all! This is where we stayed. 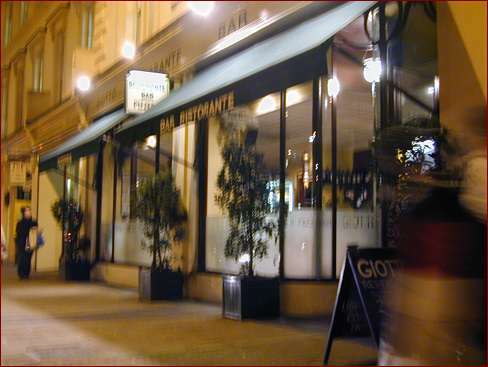 The restaurant has a small variety of French foods, authentically done. It has happened, however, that sometimes their variety and my tastes don't overlap. 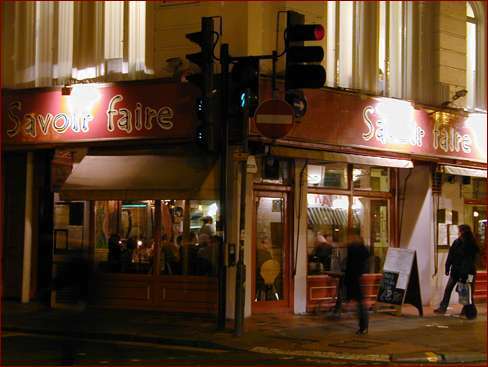 Then I go next door, to La Brasserie Savoir Faire. The corner place. Also French food, but a completely different subset. This trip I was particularly taken with the mussels in garlic and pernod butter. They're across the street from the Italian Kitchen. 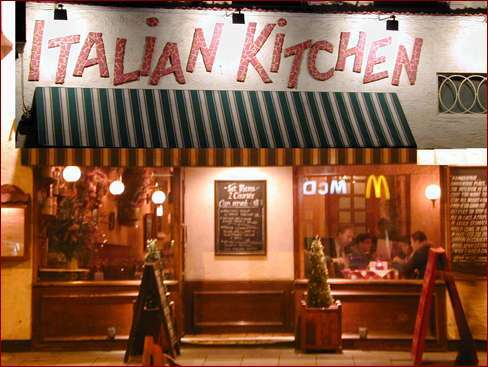 A really good variety of traditional Italian food, well made, tasty. The only one of the bunch to NOT offer take-away. Everyone found something unusual to enjoy at this place. Nice interior decor too. Just down the street is Giotti, an Italian café with all the traditional decor. The usual fare, excellent coffee drinks. Across the street from our place is the India Spice restaurant. Not the most exceptional Indian food in the London area, but it's close, convenient, and tasty. 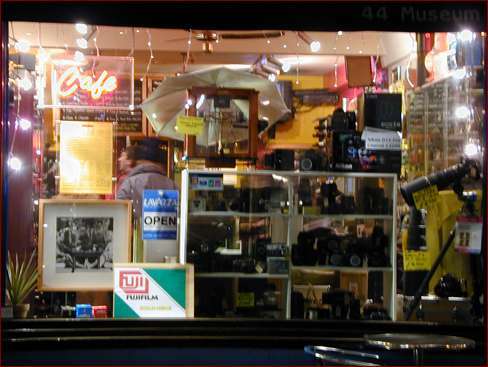 One street over, Café Muse is a camera shop, an Internet Café, and a sandwich place. My only complaint is that they close early, around 19.00, because they don't have a liquor license (which draws the after-work crowds). Have you found errors nontrivial or marginal, factual, analytical and illogical, arithmetical, temporal, or even typographical? Please let me know; drop me email. Thanks! This page is copyrighted 1993-2010 by Lila, Isaac, Rose, and Mickey Sattler. All rights reserved.